I’ve been talking about and showing snippets from my upcoming book for over a year now. For that entire year I’ve been calling it “Mermaid’s Curse”. The book is a Lovecraft meets high fantasy with witches, merfolk, and clerics bent on killing all the witches. The first book is how the curse happens, and the evil clerics trying to sacrifice her. I’ve been told “mermaid” in the title might limit sales since it’s so specific … So I’d like some feedback. Would you buy this book? Would you change the title? Suggestions maybe? Anyone who would like to read the first chapter, it’s available here! Hello all you lovely people out there in the internet land. It’s so nice to see you again. Things are finally starting to feel normal again. I’m back in writing/editing mode, completing that final chapter of Mermaid’s Curse, and getting that ready for an edit. I’ve also been writing a little here and there on a couple other things. Unfortunately I probably won’t be finishing any of them soon since I will be moving onto the second book in the Mermaid’s Curse trilogy next, but it does give me the needed breather from the trilogy so that I don’t get bogged down and start hating the book. Rule number one if you’re me… don’t spend every waking moment on the same project till you hate looking at it. Break off, get a breather, enjoy a nice margarita while reading something fun (for me that has been “The 20 Sided Sorceress“) and just… Enjoy life for a moment. Then get back to the grind stone! Also! The Ring and Small Bites 1 are free right now. AND! if you read them and sign up for my email here I will give you The Camera and Small Bites 2 for free! That’s four books… FREE! I don’t send a lot of email news letters, but hopefully you’ll enjoy them when you get them. So… one more chapter to go, and I am already a third of the way through it… So, back to writing I go! The last year finally paid off. A novel that had been stewing in the back of my mind for the last several years. The novel, Mermaid’s Curse, started out as a simple thing. The name, actually. A cursed mermaid, never allowed to fall in love least she die, and Brother Hawk, a man cursed to be a hawk, and suffer the will of the priesthood who visited inhumane tortures on him for centuries. I finished the first book of the trilogy today. The last stubborn chapter that kept whispering that it needed to be there, but wouldn’t tell me why it needed to be there until just last week. It is the third novel that I’ve completed. It actually has a few threads in common with the first book I wrote (the one that died in the computer crash.) I subconsciously picked out the best parts of that novel and used it in this one. With each novel I’ve learned something about myself, and my writing habits. With this particular completion I learned quite a bit more then ever before. Mermaid’s Curse: Book 1 is just over 50,000 words. It took almost a year to complete. Keep in mind that I started Mermaid’s Curse as a single book and it has since become a trilogy. Book 2 is now just over 50,000 words, as well, and should be about 52,000 words when finished. Book 3 is currently 5000 words of plot. It’s going to be at leas 50-60,000 words when finished. That’s a lot of writing. 50,000 of which was done just last November during NaNoWriMo. You can’t force the story sometimes. I had everything finished for Book 1 except for one small chapter. I agonized over that chapter for a while, added a few words, added some notes, deleted them, and wrote some more. But the chapter sucked no matter how I wrote it. Something was missing, and I didn’t know what. So I skipped ahead, wrote some other chapters, finished whole scenes and gave up on that one chapter. I even tried cutting that chapter out because if it was that horrible and boring it probably didn’t need to be in the book, right? Wrong. Without that chapter linking the rest of the book together the story kind of had an abrupt shift that felt ungainly and… just wrong. So that chapter sat in the back of my mind for months while I polished off other chapters, rewrote sections, and decided the novel was actually a trilogy. Then one day I was taking a shower and think about another problem chapter and it was like magic. All the pieces slid into themselves. Oddly enough the pieces fell into place because I started plotting the third book. As I plotted the third book I saw more of the world, saw new characters, and realized what needed to happen at the end of Book 2 to make Book 3 carry on. It was always the end of the books that gave me the most trouble. Once I figured out the end of Book 3 the chapters for Book 2, and that one stubborn chapter from Book 1 just snapped into place. I wrote 2000 words that night just trying to get down all the plot points so I knew what to write the next day. Really, the thing that did it in the end was just keeping the story in the back of my mind while I went about the rest of my day. Jotting down ideas helped a little, but when it finally snapped into place it had nothing to do with forcing it, and everything to do with just letting it happen naturally. The next thing I learned was about time. You only have so much. Use it wisely. I can’t tell you how many times I sat down to the PC and my daughter would suddenly need to use the computer, or my son would need help with homework, or my boyfriend would just need attention. Families take a lot of time and energy, and they are so worth it. But this means that taking those moments you get to write, pouncing on them and using them to your advantage means EVERYTHING. Even the few minutes you have on a car trip to think about the story and come up with a plan to jot down on a note is better then nothing at all. When I finally completed that chapter that I had been stuck on for a year I was so excited. I almost wanted to dance for joy. I texted four people and told them I’M FINISHED! I was that happy. Whatever you’re working on, finish it. Doesn’t matter if it’s terrible, if you have to throw it out and start over, or if you just want to burn it in a fire. Finish it. That sense of completion will give you more inspiration and perseverance then all the self help and uplifting posters with kitties hanging in there that you will ever see. This week has been a mad dash to finish book 1 of the Mermaid’s Curse trilogy, and come up with names for each of the three parts of the book. I’m tossing around the idea of “Curse Maker” and “Curse Breaker” for the first two. No idea about the third. “Curse Taker” maybe? I have to think about it. I’ve got one chapter that I am doing the final edit for on book 1, and five chapters left on book two. I’ve also been working on my NaNoWriMo plots. Like usual, I will be working on two story lines . One main project, and one to switch to when I get stuck on the first. That seems to be the easiest way to write for me. This year it will be book 3 of the Mermaid’s curse trilogy (which I have totally plotted out, and it’s going to be AWESOME!) and book 1 of the Eternal Tapestry series. A sort of prequel to Forgotten Ones. I just haven’t decided which will be the main project, and I would love to get them both finished. But that will come about as I start writing come next month. I’ve also been a bit busy on Instagram and Pinterest with sketches and what not to stay busy. 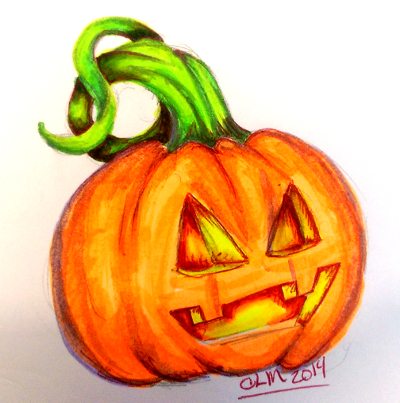 It’s Halloween, and I enjoy drawing pumpkins and skulls, so there you go. And now for some interesting videos/articles/etc that you might find amusing and/or informative. The latest Authors Earnings report is live, and it’s all about KU! LeVar Burton reads “Go the F*ck to Sleep” at a charity live stream. Neil Gaiman on scary stories and little children. Japanese SF writing contest open to AI and aliens. From Reddit: What is a science/history mystery that has been solved, but no one seems to know? And just a reminder, Small Bites 1 and Prophecy by Barlight are still free. And I will be having a couple more promo’s going on next month. And you can always sign up for my newsletter here. If you’ve been following my blog for any ammount of time you know I’ve been working on a novel, “Mermaid’s Curse.” I’ve posted a few snippets of the content, and I’ve gotten some good feedback from people who have read it. THey like the pace and the tension between the characters. They find the plot, what I’ve mentioned of it, good. First, what’s changed: It is no longer a single novel. While writing this novel, which was suppose to be 80,000 words at least, I discovered that the story had a natural break in the middle of it. The first half is about Marizza and Artiro, how they meet, fall in love, and eventually have Okira. Okira is the cursed mermaid in the title. The second half is about Okira and Brother Hawk, and how they break the curse. Two distinct tales balance around the same curse, but focusing on separate people. Then I got to the end of the second part and realized there was a third story. The curse was broken, but no one is safe until they can keep the curse from ever happening again. So, I’ve decided that the tale of the “Mermaid’s Curse” is a trilogy, not a single novel. When will they be out? That’s a really good question. I’m not sure. I would like to put them out three months apart. The first book is done so I think it’s time to get it edited and start working on a cover. Give me a month to figure some things out and I’ll let you all know more. Till then, here is a Pinterest board of things inspiring the writing, and here is a newsletter you might want to join to get more information.